This book was pretty great. I actually think it was a breath of fresh air from the recent novels. So far we’ve mostly been dealing with humans or vampires that obviously already knew about the fall of Atlantis and everything that it had to do with the nanos. This time we got a really different spin on how it was told. I believe Lynsay Sands is one of the only authors with a paranormal series that tells back story so vividly. Facts have been checked, questions have been answered and it fits so well into the current story. Sherry, the main character, had a sort of historically feel about her. The way she and Basil interacted kind of made me feel like I was reading a historical romance thrown into modern day. Decidedly, I’m sure that was done on purpose. There was sort of a slow cadence to this book that the others didn’t have. I liked it alot. It didn’t make you want to put the book down, at all. The slower crawl of the book also kept you from feeling like you just binge watched an entire season on Netflix and your eyes are drying out. It made me smile, it made me laugh and definitely there was a little frustration in there also! I hope you enjoy the book! I definitely recommend reading it! P.S. The Immortal Who Loved Me is the newest installment in a long series about the Argeneau family. I would suggest starting from the beginning with A Quick Bite, the series is definitely superb! Previous Post Lynsay Sands! My Favorite! 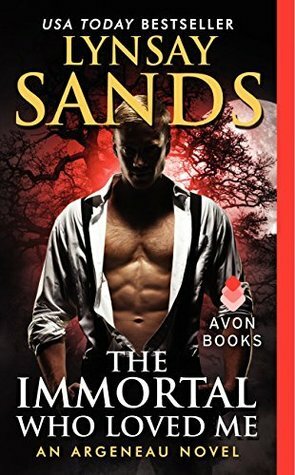 Sands is really a great writer, and I’m glad to hear that her latest book is good too. I’ll have to pick this one up. Such a skill for an author to make sure people are up to date, without retreading the same ground twice! Think I’ll check this one out, sounds good. Exactly! Thanks for check out my review!